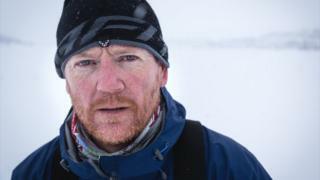 A former Royal Marine who has completed a 745-mile (1,200km) solo trek to the South Pole has described the conditions as "absolutely horrendous". Baz Gray, 45, from Buckland Monochorum, Devon, said unusually heavy snow had made the middle section the toughest period of his life. He had to eat 10,000 calories each day, covering an average of 19 miles (31km) while dragging an 85kg (187lbs) sled. Mr Gray arrived at the South Pole at 19:00 GMT on Sunday after 39 days. The expedition was a practice run for a record-attempting solo trip across the whole of Antarctica planned for 2019. He is raising money for children who have lost parents or live with family members with post-traumatic stress disorder (PTSD). Mr Gray said his mental strength was forged from 25 years of life experience and the "hardship" of serving in the Royal Marines. He was a regimental sergeant major, serving for 26 years. He said: "There were very unusual climactic conditions - there's been a lot of heavy snow. I needed to make over 15 nautical miles per day, and on one day I did two. "Going through that period was the toughest period of my life mentally, but something always tells me to keep going - it's that mental resilience". Mr Gray travelled for 39 days completely unassisted, using skis and dragging a sled in temperatures reaching -20°C (-4°F). He was flown out of the South Pole to a base camp on Sunday night, and will then fly to Punta Arenas in Chile before heading back to the UK. The expedition was phase one of his Challenge Antarctica series, with phase two planned for the next Antarctic summer in November 2019. The second phase will be a 1,600-mile unsupported and unassisted trek across the entirety of the Antarctic continent, starting from the Bay of Whales.